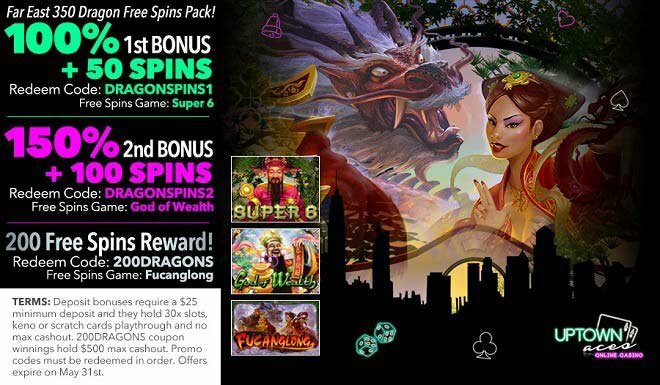 Uptown's 350 Dragon Free Spins Pack! A dragon can fly into the sky, ride on clouds, dive deep into the ocean and also help you amass gigantic wins this mid-May as you take a virtual trip to the Far East in the Uptown reels with a duo of bonuses + 350 Free Spins! Immerge yourself in the reels of our Asian-themed slots and claim a 1st 100% Match + 50 Super 6 Spins, a 2nd 150% Bonus + 100 God of Wealth Spins and put an end to your journey to the Far East with 200 Free Fucanglong Spins! Dragons bring abundance and it will be part of your last few weeks of May when you deposit as little as $25 to make it to the Far East and claim 350 Dragon spins! Deposit bonuses require a $25 minimum deposit and they hold 30x slots, keno or scratch cards playthrough and no max cashout. 200DRAGONS coupon winnings hold $500 max cashout. Promo codes must be redeemed in order. Offers expire on May 31st.